I'm not at all sure this has anything to do with Disney/Marvel. WB has being making rumors about the future of DC for about a year now, and having someone like Paul Levitz step down from his role isn't something that just happens...that takes a good few weeks of discussion <I>at the least</I>. So that's a pointer that WB/DC have been looking at a restructure for a while. On the flipside, DC hasn't really been "DC Comics" for a good couple of years now anyway, with the new branding really only playing up the "DC" logo as opposed to including "Comics" in there (sometimes it's there, sometimes not, but mainly not). And with all the other "DC ..." lines that have been coming out, I don't think things will be superficially altered in any way, as it happens. The name and personnel change is more about giving WB more direct control over those aspects, just as they did with New Line. Still, good that Levitz is still there...at least what he did good has been remembered and that will hopefully mean consistency, even if as George says, the output may be more closely scrutinized. Reading more on this, close friends of Levitz have said that his leaving the Publisher position has been in the works for a long time. He was just looking for the right time. And yes, this reorganization has also been hinted at for quite a while now, though the Disney-Marvel announcement may have hastened this one a bit. I think it's good to expand but it's also good to pay attention to what you already have; more WDAS features in development would really help IMHO. 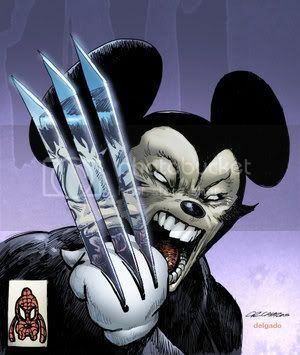 Posting the full image of what is one of the funnier Disney/Marvel mergers I've seen online. 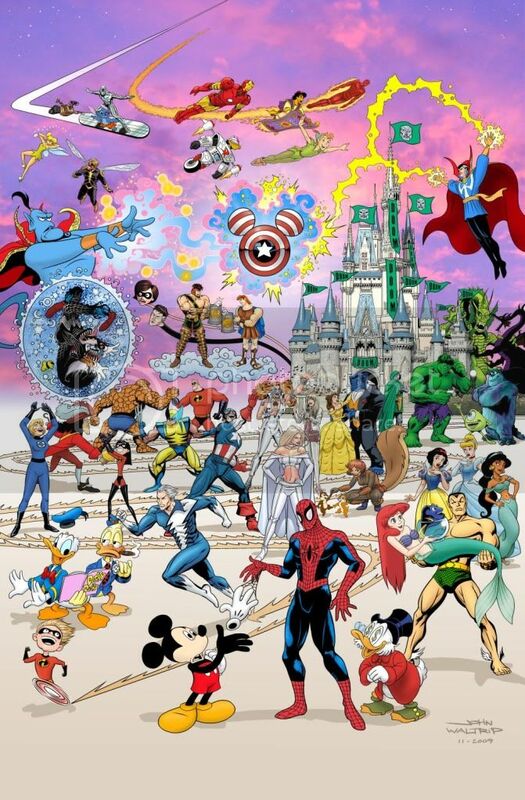 Pay careful attention to Beauty and THE Beast, Scrooge McDuck, Dash and Quicksilver, and Venom Vs Goofy... There's lots more in the image but those are the big ones that pop out (besides the modification to Captain America's shield!). Location: I'll be watching you! That is awesome! Haha Stitch. Where did you find that, George? Doom has taken over the Magic Kingdom! My favorite part is Squirrel Girl playing with Chip n' Dale. Dacey wrote: Where did you find that, George? Not sure, really. I tried to do a 'History' and the site didn't come up!! Lord Akiyama wrote: Doom has taken over the Magic Kingdom! There IS something appropriate about him taking over Cinderella's castle! There are at least a half-dozen good gags in that image. Where to begin, where to begin...! Although it's obvious and up-front, I do love Mickey's face after shaking hands with Spidey and having his glove accidentally webbed off! And the long-awaited meeting of Donald and Howard. droosan wrote: My favorite part is Squirrel Girl playing with Chip n' Dale. Ben wrote: Although it's obvious and up-front, I do love Mickey's face after shaking hands with Spidey and having his glove accidentally webbed off! Personally I found the image of Mike and Sully giving The Hulk a monster union rep card priceless! Also thought the New (or is it Uncanny?) Beauty and THE Beast (X-Man Hank McCoy) was a nice site gag, too. That poster is all kinds of awesome. Really good job. Yes, I'm bumping a really old thread. But there's a fun article up on Newsarama that evaluates how the $4 billion investment has worked out for Disney and Marvel. It’s been five years since the Walt Disney Company bought Marvel for $4 billion. In the immediate, the Internet showed its ability to put mouse ears on the Hulk at every freakin’ blog ever. Yeah, kinda fun to look back at those paranoid post-Eisner "Disney's going to turn The Avengers/Star Wars into Mickey and Goofy and Cinderella!" fan-artwork screeds from '10. They just couldn't get their minds around it. Last edited by EricJ on July 1st, 2015, 1:31 pm, edited 1 time in total.